Postprocedural chest X-ray (CXR) is considered the gold standard to determine proper CVC tip placement and to rule out complications. Various techniques have been developed to ascertain CVC tip placement which include anatomical landmark-guided methods, formulas (e.g. Peres' height formula), and use of diagnostic assists (i.e. right atrial [RA] electrocardiogram [ECG] and transesophageal echocardiography [TEE]). Joshi et al. reported that utilization of an ECG-guided technique was a useful tool for accurate positioning of CVC tip placement and the procedure was found to be reliable compared to Peres formula. This technique could avoid CXR confirmation in uncomplicated insertions minimizing cost and radiologic exposure to patients and health-care workers. Our research group thus conducted this study with a primary objective to assess correct positioning of the CVC tip by comparing an anatomical landmark technique and an ECG-guided technique. This study also aimed at comparing the catheter insertion time between the two techniques and to assess various complications associated with inaccurate CVC tip placement. Institutional review board approval was obtained before initiating the study and informed consent was taken from all participants before the procedure. A total of 144 patients who presented to the ED in a tertiary care hospital, requiring CVC were enrolled. Critically ill patients, 18-year-old or greater who required CVC placement were included. Participants were randomly assigned using an internet-based computer program (http://www.randomizer.org) either to the anatomical landmark group (CVC using a landmark-guided technique) or to the ECG group (CVC using ECG-guided technique). Patients with coagulopathy or abnormal cardiac disorders such as atrial fibrillation, multifocal ventricular premature beats, supraventricular tachycardia, left bundle branch block, or pacemaker were excluded from this study for safety concerns. Sample size was calculated using the difference in average depth of CVC between the two methods as obtained from a previous study. Thus, the minimum sample required in each group was found to be five with a 95% confidence and 90% power. More than 70 participants under each group were included in this study. All participants were cannulated in the right internal jugular vein (IJV). The participants were placed in Trendelenburg position, which dilates the vein and this position makes the external jugular vein more prominent. The patient was prepared and draped, a 16 cm triple lumen nonimpregnated CVC was inserted using catheter-over-guidewire technique (the Seldinger technique) with the aid of ultrasound. A single operator performed the procedures in both the groups. In both the methods, the vein was identified with the aid of ultrasound using phasic respiratory pulsations and ease of compressibility method. Then, it was centered on the ultrasound screen before initiating the procedure [Figure 1]. 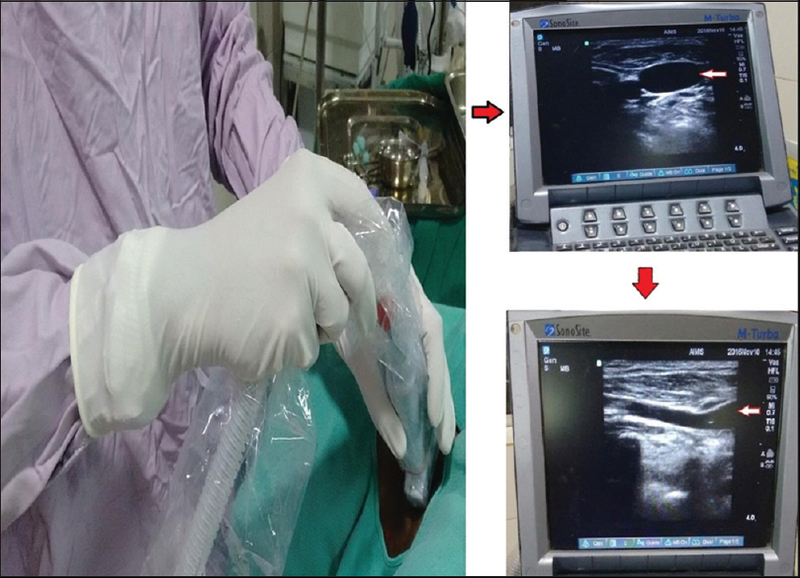 The vessel was cannulated using ultrasonography through dynamic (real-time) method and the static (indirect) method. In the landmark technique, the right IJV was catheterized using the posterior approach. The point at which the vein crosses the sternocleidomastoid muscle is used as the landmark. After the procedure, patients were returned to supine position. In the ECG-guided technique, an electrical device is always required, if the atrial ECG is to be transmitted and recorded through a lead cable to the monitor. Hence, a universal ECG adapter is used, to record the ECG from the heart independently from the type of ECG monitor. The adapter has four parts [Figure 2]. The lead cable (Part A) coming from the monitor will be fixed to the universal adapter. During catheter advancement with the guidewire, the disposable cable (Part B) will be clamped to the guidewire on one end and plugged to the ECG adapter at the other end. On the top of the universal adapter, there is a knob to switch the recording between the intra-atrial potential and the skin potential (Part C). By changing the position of the switch, it is possible to read the ECG either as standard surface ECG or as an intracavitary ECG. The universal adapter itself possesses a lead cable with a clamp, which will be fixed to the red skin electrode (Part D). When the CVC tip advances from the IJV into the SVC, a normal amplitude P-wave is noticed on the ECG monitor. By monitoring the P-wave, catheter tip is located as it travels through the SVC-RA junction and RA [Figure 3]. As the catheter is slowly advanced, while maintaining an eye on the configuration of the P-wave in lead II on the ECG monitor, an abrupt increase in the height of the P-wave is noticed, reflecting the closeness of the intracavitary electrode (the tip) to the sinoatrial node. If the catheter tip is further advanced deep into the right atrium, the P-wave height declines, appears bifid or even has a negative deflection.,, In case of over-insertion, the CVC is withdrawn at 0.5 cm intervals until the P-wave returns to a normal configuration. Once in correct position, the CVC is secured at that point on the skin, sutured, and dressed. In the anatomical landmark method, before CVC placement, the vertical distance between the brachiocephalic notch of the right clavicle, and the carina was calculated on the routine posterior-anterior CXR, using hospital image viewer system (Medvision). The clavicular notch can be consistently palpated 0.25–1 cm lateral to the sternal head of the clavicle on the superior surface of the clavicle and easily identified on the CXR. Before insertion, the catheter depth was calculated by adding the length between the needle insertion point and the clavicular notch and the vertical distance between the clavicular notch and the carina on the CXR. After insertion of the CVC, the patient was monitored for any hemodynamic deterioration and a repeat ultrasound-chest was done to rule out pneumothorax. A portable anterior-posterior CXR was taken in all patients, to confirm the placement and positioning of the CVC. Before the CXR, the patient was supinely positioned. The whole length of the SVC was defined on CXR as the area from the lower border on the first right costal cartilage close to the sternum to the conventional radiographic SVC-RA junction (apex of the concave shadow by superposition of the distal SVC on the RA). A standardized method was used to describe the position of the CVC tip, so that the whole length of the SVC on CXR was divided into three equal segments (upper, middle, and lower SVC). The vertical distance between the CVC tip and the carina was measured on the postprocedural CXR. Final insertion length of the CVC, time to CVC placement, and postprocedural complications were recorded. Data analysis was performed using IBM SPSS 20 (IBM Corp. released 2011. IBM SPSS Statistics for Windows, Version 20.0, Armonk, NY, USA). Independent two-sample t-tests Chi-square-tests were used for comparison between the two groups. P <0.05 was considered statistically significant. Out of the total 144 participants, 72 were allotted to the landmark group and 72 to the ECG-guided group. In the landmark group, 48 (66.7%) were male and 24 (33.3%) were female. In the ECG-guided group, 30 (41.7%) were male, and 42 (58.3%) were female [Figure 4]. Malposition was defined as CVC tip placement in a vein other than the SVC, the right atrium, impingement with the lateral wall of the SVC and arterial cannulation. Eventhough overinsertion is a kind of malposition, in this study, it is analyzed as separately from other types of malpositions. On postprocedural CXR, it was observed that 13 (18%) in the landmark technique were malpositioned as compared to none in the ECG-guided technique. This difference was statistically significant (P = 0.000) [Figure 5]. The mean insertion time taken for CVC placement was 10.23 ± 1.8 min in the landmark technique as compared to 9.55 ± 1.45 min in ECG-guided technique. This difference was not found to be statistically significant (P = 0.073) [Table 1]. Postprocedural CXR revealed that 30 (41.7%) in the landmark group were overinserted which required immediate correction, compared to none in the ECG-guided technique. This was found to be statistically significant (P = 0.000) [Table 2]. 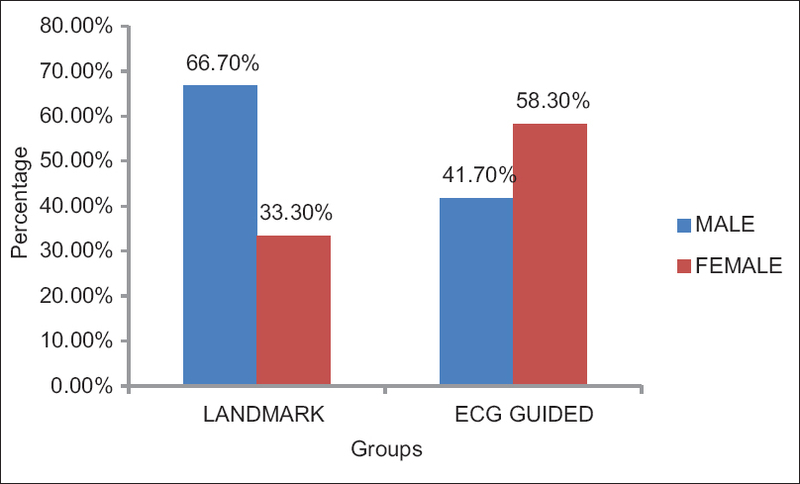 In the present study, the incidence of atrial arrhythmias and ventricular ectopics are categorized under “arrhythmia.” During the procedure, it was noted that 22 (30.6%) in the landmark group had arrhythmias compared to none in the ECG-guided group. This difference was found to be statistically significant (P = 0.000) [Figure 6]. Postprocedural ultrasound-chest revealed no occurrence of pneumothorax in both the groups. In this cross-sectional, comparative study, it was observed all the CVC tips in the ECG-guided group were properly positioned without any increase in the placement time, with a significant reduction in need for postprocedural corrective measures. These factors could represent significant advantages over anatomical landmark-guided CVCs. CVC tip malpositioning as observed by various authors range from 1.8% to as high as 9.3%. There are multiple studies to support the evidence of ECG guidance for accurate placement of the CVC tip. Ender et al. demonstrated that TEE can locate the CVC tip in relation to the P-wave amplitude on intravascular ECG. Jeon et al. reported that the tallest peaked P-wave seen on intravascular ECG corresponded to the CVC tip location at the SVC-RA junction using TEE to confirm catheter position. It was reported by Chu et al. that a sodium bicarbonate-flushed catheter that conducts the ECG signal showed the largest P-wave, when the catheter tip was positioned within 1 cm of the upper edge of the cristae terminalis, later confirmed by TEE. Smith et al. had demonstrated that a difference in P-wave amplitude was statistically significant when measuring the height of the P-wave at the SVC-RA junction, compared with 3 cm and 5 cm within the RA. Thus, this study adds to this body of evidence that CVC tip placement can be accurately performed under ECG guidance. In the present study, postprocedural CXR revealed that 100% of CVC tips were correctly placed in the ECG-guided group compared to 82% in the landmark group. 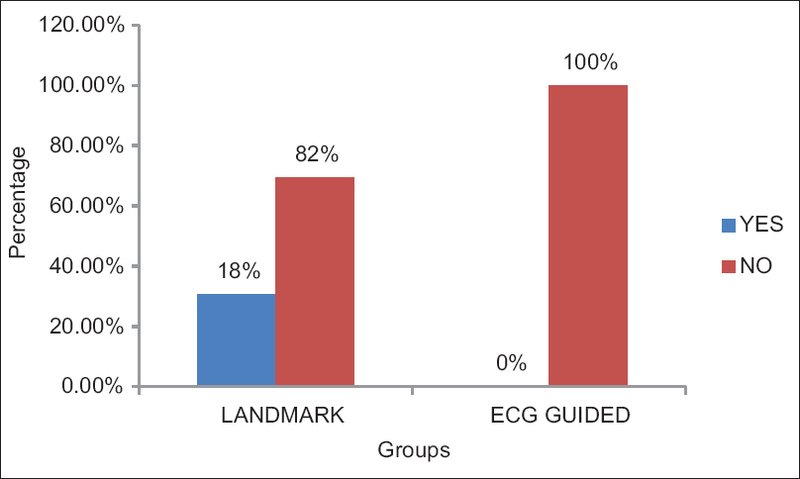 These findings were comparable with previous studies although variable success rates were reported, ranging from 96% to 100% in the ECG-guided group and 52%–76% in the landmark group.,,,,, Interestingly, the success rate of our landmark group was higher than any of the previous studies, yet the comparison of the ECG to landmark groups was still statistically significant. Thus, the primary objective of accurate CVC tip placement was demonstrated in the ECG-guided group, and the observations in this study were reproducible and accurate when considering previous literature. In the present study, CVC tip malpositioning was nil in the ECG-guided group, which was consistent with the study done by Sharma, who demonstrated a range of 1.8%–9.3%. The present study demonstrated appreciable reduction in the depth of the CVC inserted into the SVC with the application of ECG-guided technique compared to the landmark technique. Delays in detecting malpositioning by CXR can be avoided by applying the ECG-guided technique. Duration of insertion was calculated from the time at which the needle made contact to the skin and ended with the aspiration of blood from the CVC. In the present study, the mean insertion time taken for CVC placement was 10.2 min in the landmark method as compared to 9.55 min in ECG-guided method, which was not statistically significant. Sharma et al. reported an average insertion time of 13.8 min in the landmark technique and 15.7 min in the ECG technique. Interestingly in our study, insertion time in ECG technique was shorter compared to landmark technique. We feel that there are two possible reasons for these findings. With regards to the shorter time intervals, Mcgee et al. had reported that the CVC procedure can be completed faster on subsequent attempts once the health-care provider becomes familiar with the technique. According to Pittiruti et al., the ECG-guided technique saved time by avoiding the need to reposition the catheter and wait for a repeat CXR. This confirms the fact that the ECG-guided technique does not add time to the CVC procedure. Complications from CVC placement include overinsertion, malpositioning, arrhythmias, pneumothorax, and arterial puncture. Although Lee et al. reported that the landmark technique was free of potential complications compared to the ECG-guided technique, our study found the converse to be true with more notable complications in the landmark technique. In the present study, 41.7% of CVCs in the landmark technique were overinserted compared to none in the ECG-guided group. This was statistically significant and has been supported by another study where 30% were overinserted in the landmark technique, compared to none in the ECG-guided technique. With regard to potentially dangerous malpositioning, one study found an intraatrial or intraventricular placement of the CVC tip in 10% of the landmark group versus none in ECG-guided group. We did not observe any intraatrial or intraventricular placements of the CVC tip. The occurrence of arrhythmia in ECG-guided technique was zero, as the CVC tip placement could be monitored real-time, whereas in landmark technique, arrhythmias can only be detected after the procedure. 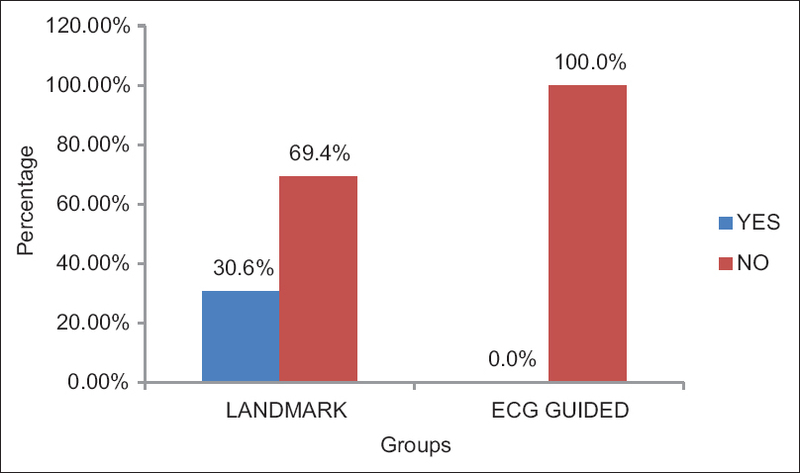 In the landmark group, 30.6% patients had arrhythmias, and the difference was statistically significant. This was comparable to a study conducted by Joshi et al., in which it was reported 12% had arrhythmias. Thus, there is a compelling evidence to believe that the ECG-guided technique is safer for the patient. Although the occurrence of pneumothorax and arterial puncture have been reported with CVC catheterization using landmark technique, in the present study, there was no occurrence of such complications. The main advantage of the ECG-guided technique is that it gives definitive information about the position of the CVC tip directly during the procedure, thus saving time and resources. This method can be performed at the bedside and is accurate, safe, simple, noninvasive, and easy to learn. The cost as well as the X-ray exposure associated with radiological assessment can be avoided. The ECG adapter is relatively inexpensive, requires only a single purchase, and can be used numerous times in a patient with reproducible results. Documentation of the procedure can be appropriately made and hence also useful for medicolegal purposes. The ECG-guided technique cannot be used in conditions where the P-wave is absent or not recordable on the ECG monitor (i.e., atrial fibrillation, atrial flutter, or pacemaker-driven rhythm). Another limitation is the variable parallax effect of the portable anterior-posterior CXR in the supine position, which is used to check the position of the CVC tips. However, the carina and SVC are located at the same depth and at the center of thorax, this effect may be negligible. The third limitation is that only radiographic confirmation has been used to evaluate the CVC tip. Because echocardiographic estimation of the SVC-RA junction position places it deeper than the radiographic SVC-RA junction, the CVC may have actually been in a higher position, and hence comparison between the two techniques is tedious., However, since the current practice is of using portable CXRs, it has been used in the study. The cost-effectiveness of the ECG-guided technique was not evaluated in this study. Another limitation involves that P-wave changes can also be due to the pericardial reflection and not the presence of the catheter tip at the SVC-RA junction., However, it was not observed in our study which were in accordance with other authors. This study could serve as a pilot study and a multicenter study would provide more generalizable results. This study adds to the literature supporting the ECG-guided technique of CVC placement. ECG-guided CVC placement proved accurate in consistently guiding the terminal tip to the SVC-RA junction. This study once validated in a larger cohort would allow CVC placement without radiological confirmation. The study demonstrated a definite correlation between the peak height of the P-wave and the location of the terminal CVC tip. With this knowledge, transition from placing CVCs using ECG guidance with CXR confirmation to confirmation of tip placement using just ECG guidance without CXR confirmation can be genuinely applied. However, in situations where the P-wave is absent or not recordable, the CVC-tip position has to be confirmed with CXR. In cases where P wave is recordable, application of the ECG-guided technique for CVC tip placement saves time which was previously spent waiting for CXR confirmation and subsequent tip repositioning. In addition, ECG placement saves the expense of an imaging and added radiation exposure. The ECG-guided CVC placement technique used in this study provided precise CVC tip positioning demonstrating that ECG could be used as an alternative tool to the conventional landmark method with CXR. Pittiruti M, Scoppettuolo G, La Greca A, Emoli A, Brutti A, Migliorini I, et al. The EKG method for positioning the tip of PICCs: Results from two preliminary studies. J Assoc Vasc Access 2008;13:179-86. Lee JH, Bahk JH, Ryu HG, Jung CW, Jeon Y. Comparison of the bedside central venous catheter placement techniques: Landmark vs. electrocardiogram guidance. Br J Anaesth 2009;102:662-6. Sharma D, Singh VP, Malhotra MK. Optimum depth of central venous catheter – Comparision by pere's, landmark and endocavitory (atrial) ECG technique: A prospective study. Anesth Essays Res 2013;7:216-20. Smith B, Neuharth RM, Hendrix MA, McDonnall D, Michaels AD. Intravenous electrocardiographic guidance for placement of peripherally inserted central catheters. J Electrocardiol 2010;43:274-8. Chu KS, Hsu JH, Wang SS, Tang CS, Cheng KI, Wang CK, et al. Accurate central venous port-A catheter placement: Intravenous electrocardiography and surface landmark techniques compared by using transesophageal echocardiography. Anesth Analg 2004;98:910-4. Joshi AM, Bhosale GP, Parikh GP, Shah VR. Optimal positioning of right-sided internal jugular venous catheters: Comparison of intra-atrial electrocardiography versus Peres' formula. Indian J Crit Care Med 2008;12:10-4. Baldinelli F, Capozzoli G, Pedrazzoli R, Marzano N. Evaluation of the correct position of peripherally inserted central catheters: Anatomical landmark vs. Electrocardiographic technique. J Vasc Access 2015;16:394-8. McGee WT, Ackerman BL, Rouben LR, Prasad VM, Bandi V, Mallory DL, et al. Accurate placement of central venous catheters: A prospective, randomized, multicenter trial. Crit Care Med 1993;21:1118-23. Uchida Y, Sakamoto M, Takahashi H, Matsuo Y, Funahashi H, Sasano H, et al. Optimal prediction of the central venous catheter insertion depth on a routine chest X-ray. Nutrition 2011;27:557-60. Schuster M, Panning B. Electrocardiographic guidance in placing central venous catheters. Crit Care Med 2000;28:3577-8. Jeon Y, Ryu HG, Yoon SZ, Kim JH, Bahk JH. 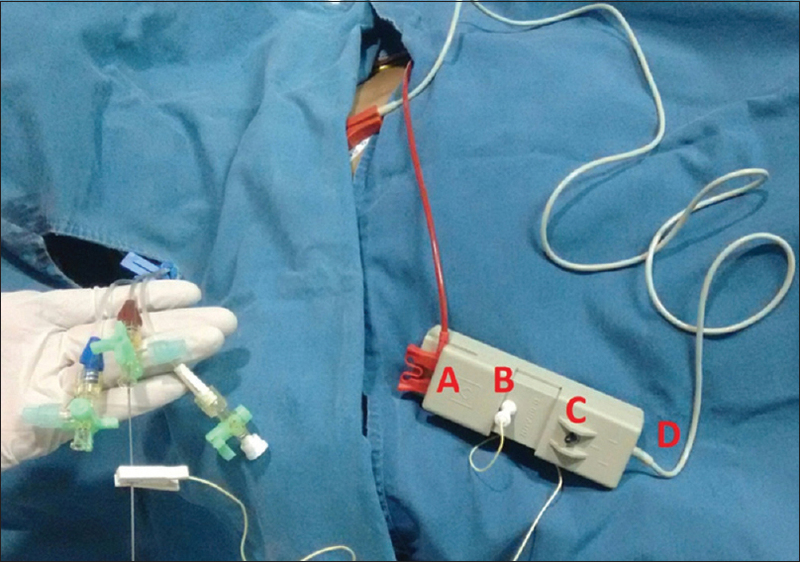 Transesophageal echocardiographic evaluation of ECG-guided central venous catheter placement. Can J Anaesth 2006;53:978-83. Gebhard RE, Szmuk P, Pivalizza EG, Melnikov V, Vogt C, Warters RD, et al. The accuracy of electrocardiogram-controlled central line placement. Anesth Analg 2007;104:65-70. Ryu HG, Bahk JH, Kim JT, Lee JH. Bedside prediction of the central venous catheter insertion depth. Br J Anaesth 2007;98:225-7. Stonelake PA, Bodenham AR. The carina as a radiological landmark for central venous catheter tip position. Br J Anaesth 2006;96:335-40. Schuster M, Nave H, Piepenbrock S, Pabst R, Panning B. The carina as a landmark in central venous catheter placement. Br J Anaesth 2000;85:192-4. Francis KR, Picard DL, Fajardo MA, Pizzi WF. Avoiding complications and decreasing costs of central venous catheter placement utilizing electrocardiographic guidance. Surg Gynecol Obstet 1992;175:208-11. McGee CD, Gould MK. Preventing complications of central venous catheterization. N Engl J Med 2003;348:1123-33. Schummer W, Schummer C, Schelenz C, Brandes H, Stock U, Müller T, et al. Central venous catheters – The inability of ’intra-atrial ECG’ to prove adequate positioning. Br J Anaesth 2004;93:193-8. Schummer W, Herrmann S, Schummer C, Funke F, Steenbeck J, Fuchs J, et al. Intra-atrial ECG is not a reliable method for positioning left internal jugular vein catheters. Br J Anaesth 2003;91:481-6.